What happens under the floating lip of ice sheets and glaciers could mean more sea-level rise in the next century. A few months ago, ocean and climate researcher David Holland stepped out of a ski plane onto the hard-packed surface of an ice shelf that juts out from the Pine Island Glacier in West Antarctica. Happy to have landed safely on this vast plain studded with deep crevasses and brushed with icy wind, Holland and his colleagues looked out over the broad tongue of ice with the wheels of a five-year research mission turning in their heads. Holland, a professor at New York University, believes that the boundary between that ice he tread on his six-week trip and the water circulating beneath it could be the key to better understanding sea-level rise in the next century. The way the Pine Island Glacier’s (PIG’s) hanging lip interacts with the water it floats on may help control whether the glacier slips into the ocean slowly or quickly. And the speed that land-based ice like a glacier slips into the ocean, he says, could determine whether seas will rise a few centimeters in the next century, or tens of times more. Current models of sea-level rise don’t include information about what’s happening under ice shelves. Without that piece of the picture, Holland and others think that such models can’t be accurate enough to make real predictions. In late February, Holland and scientists from around the world met to discuss the recent trip to West Antarctica, how the ice shelves could affect the melting of large ice sheets behind them, and what kind of helicopters, robots and computer models would help them find out. “If you think about how to engineer dikes, bridges, water systems, you really have to be able to predict where sea level will be in 100 years. We think it’s between eight and 90 centimeters [from current models], and that’s a really big range. But, my goodness, what if we’ve made a mistake here, and ice-ocean interaction could change that by like a meter? It really starts to be an enormous concern,” explains Jesse Johnson, a computer scientist at the University of Montana and a participant in the February workshop at New York University. “Glaciers grow slow, but they go fast,” says Holland. And one thing that could change how fast they go, or melt, is the strength and safety of their floating ice shelves. 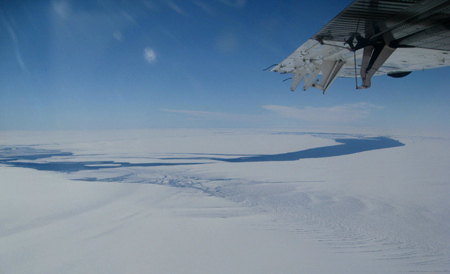 “We’re trying to find out how water under an ice shelf could make the ice sheet speed up. And if it could,” he says. Ice shelves themselves don’t add to sea level if they melt, Holland stresses. All the ice shelves in the world could melt, and sea level would stay stable—the same way that the level of water in a cup with an ice cube floating in it stays the same as the cube melts. But ice shelves may act as plugs for the land-based ice behind them, keeping it from slipping into the ocean and melting. Holland is worried that fast-melting ice shelves could cause a “runaway scenario” where ice sheets behind them speed up their journey towards the sea, dramatically raising sea level. What needs to be determined is just how much of a role ice shelves play and how sensitive they are to the ocean underneath them. In small Greenland glaciers, Holland has seen fast melting of ice shelves cause the ice sheets behind them to slide into the ocean faster, but it isn’t clear yet if the same things are happening or will happen at the PIG ice shelf. In Antarctica, a speedup could be much more of an issue because there is much more ice there to begin with. Scientists agree that changes in the atmosphere and currents west of Antarctica are occurring. This could allow more warm, deep water up onto the continental shelf and under the PIG ice shelf and other ice shelves, says Stan Jacobs, a climate scientist at the Lamont Doherty Earth Observatory at Columbia University. “Water can melt ice much faster than air,” Holland says, explaining that a small change in water temperature could do much worse than a small change in air temperature due to global warming. So far, global sea-level models include atmospheric changes, wind, air temperature and some glacier movement, but not a detailed treatment of the way ice shelves might react to warmer water. The big reason for that, Holland explains, is that scientists just don’t have enough information. They need to collect more data in the field. To do accurate predictions, scientists hope to create ice-shelf models that they can attach to global climate models. “Coupling models of the ocean with models of ice is the hard part,” says Todd Ringler, a Los Alamos modeler who attended the workshop. It’s a boundary—solid to liquid, warm to cold and salty to fresh. That is hard to simplify, he explains. Modelers need to know more about the real-life ice shelves: what is happening underneath them, how melting changes their thickness and position and how an ice shelf affects land-based ice. These questions have led Holland and colleagues to embark on their five-year study in West Antarctica. “This project is targeting the PIG ice shelf because that’s what lights up in satellite observations as a site of astonishingly fast change,” says Robert Bindschadler, a NASA field researcher and leader in the field of glaciology who worked with Holland on the trip this January. It’s moving into the ocean at about four kilometers per year, says Holland—the fastest of any ice shelf in the area. Research in Antarctica is both expensive and dangerous, even with the $4 million Holland’s team received from the National Science Foundation. The area that Holland wants to access is underneath 500 to 1000 meters of ice. One way to collect data from beneath the ice shelf is with remotely operated submarines that can glide in from open water. But these machines cost several million dollars, Holland says, and with all the variables at the PIG ice shelf, they would be easy to lose or break. Also, using automated subs, Holland could only collect data while on the ice shelf, and he’d prefer to be able to measure conditions continually. Rather than use a sub then, Holland and his collaborators hope to lower instruments through a hole drilled down to the shelf’s base, which will give them more control over their equipment. This year’s expedition was mostly to sort out these kinds of logistical issues, says Bindschadler. “Our question for this trip was: ‘Can we bring our toys here?’” explains Holland. “And the answer was: ‘Yes, but . . . ” Holland and Bindschadler both view the trip as a success. They made it onto the shelf, planned future trips and positioned a weather station to collect atmospheric data. However, the travel plans do need to be revised. After making a successful but frightening landing on the PIG ice shelf, Holland says, the plane’s pilot told the scientists that there was no way he would ever be landing there again. Crevasses in the shelf make finding a place to land difficult, and the pilot had to make several runs over the surface to ensure a safe landing. The travel plans for the next trip are still up in the air, and Bindschadler worries that other important Antarctic projects might push their research to the back of the line. He hopes not, though, because modelers are waiting for the data the team will collect. “We just have to get this work done,” he says. As long as they can get back to the PIG, the team’s data will be used to tweak computer models to better predict sea-level rise. With data about the interaction of water and ice shelves, Holland and others think that predictions might be higher than they have been in previous models. This would mean more damage to coastal infrastructure and populations. Holland hopes that the team will be able to land next time with helicopters—a safer, if more expensive, option. Camped briefly on that icy ledge next January, they will take the next tenuous steps to reach the pockets where ice meets ocean—where the seeds of rapid sea-level rise may already be planted. Also on Scienceline . . .
Scientists worry that warming waters could endanger the Great Barrier Reef. The Antarctica Strain: microbes can survive 8 million years on ice.